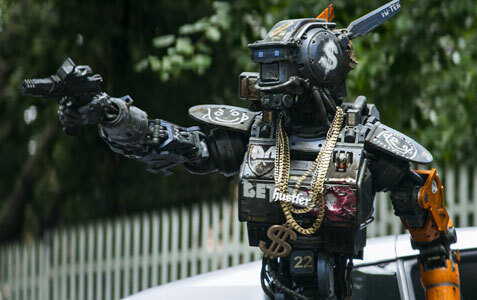 It is in no way surprising that among the first words uttered by an audience member upon the conclusion of the advance screening of “Chappie” involved the phrase “if ‘Robocop’ and ‘Short Circuit’ had a baby.” After all, the film – co-written by Blomkamp and his wife, Terri Tachell – takes place in the not-too-distant future and revolves around the decision by the city of Johannesburg, South Africa to adopt a partially robotic police force. 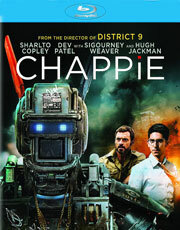 These aren’t cyborgs, a la the officer formerly known as Alex Murphy: they’re 100% robot, designed by programmer extraordinaire Deon Wilson (Dev Patel). Despite what he’s already achieved in his field, Wilson continues to strive for a greater breakthrough, focusing his sights on the goal of cracking the consciousness code, as it were, and creating the first sentient robot. 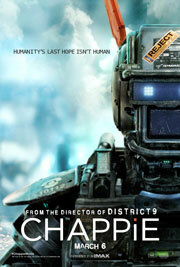 As you might expect, Wilson achieves this goal in short order, but his boss (played by Sigourney Weaver) isn’t wooed by his pitch to experiment with his consciousness program on a damaged robot marked for destruction and denies his request. Now, in fairness, his pitch is really, really terrible. Who goes to the head of a company that makes police robots and starts off by mentioning that one of the benefits of sentience is that a robot can judge the merits of art and write its own poetry? But as you might also expect, her denial in no way stops him from deciding to swipe the deactivated robot and do his experiment anyway.